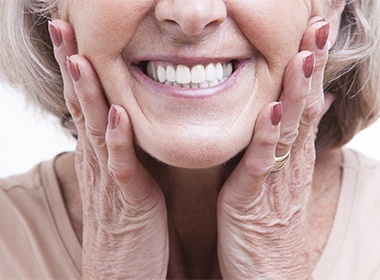 In the past, receiving a permanent crown to restore a decayed or worn tooth meant attending several appointments and wearing a temporary while waiting for the final restoration. Sometimes, an unsightly dark band showed at the gum line of an otherwise all-white dental crown (a hallmark of porcelain-fused-to-metal restorations). As a skilled practitioner on the leading edge of dental care, Dr. Salivonchik offers patients an alternative. He uses state-of-the-art CEREC CAD/CAM technology to create custom both e.max CEREC and e.max crowns as well as onlays in a single visit. Why Choose S. John Salivonchik, D.M.D., P.C. for CEREC One-Visit Restorations? Digital impressions-no more messy dental putty! 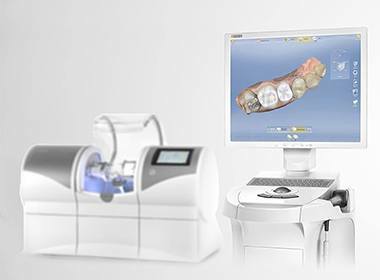 Our computer-driven CEREC milling unit fabricates all-white, reliable, and durable dental restorations. Dr. Salivonchik digitally scans the tooth to be restored, then transmits the information to the CEREC unit to fabricate a custom CEREC single visit dental crown while you wait. CEREC saves patients time and provides fully functional and esthetically pleasing restorations to counteract dental damage and preserve teeth. There are no messy impression trays, no labs involved, and no need to wear a temporary. Our desire to deliver customized dentistry is fueled by our patients’ unique dental needs. Dr. Salivonchik has completed countless hours of research and advanced study to deliver what he feels are the best dental solutions available today, CEREC. 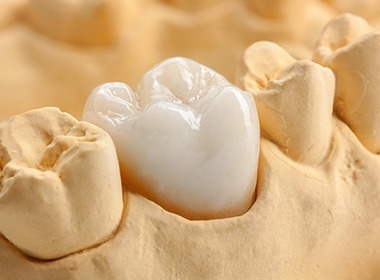 Crowns made of e.max porcelain provide twice the strength of conventional porcelain. They look and feel completely natural, too. If you’ve had an all-white crown placed in recent years, you may have noticed a dark ring at the base. This ring is the metal foundation of the crown showing through the porcelain. CEREC and e.max crowns contain no metal, which allows Dr. Salivonchik to fabricate tooth-colored restorations that are virtually indistinguishable from natural teeth. Call our Lehigh Valley dental office today to schedule your appointment or consultation with Dr. Salivonchik. Our practice serves the Whitehall-Coplay area, the Allentown, Bethlehem, Easton area, the Poconos, and surrounding areas. We’re ready to provide the general, restorative and cosmetic dentistry procedures you and your family need to maintain optimal oral health and an aesthetically pleasing smile.